Good Home Inspection is owner operated by “Bud” Rozell, ACI TREC 4088. Bud is a licensed Professional Inspector and a licensed Pest Control Applicator, the highest designations in these fields recognized by the State of Texas. Bud Rozell AKA Good Home Inspection has been practicing real estate inspections “full time” since 1996. He has a background in home improvement, apartment maintenance, and commercial property maintenance. Bud has taught and developed classes for the National Apartment Association’s Certified Apartment Maintenance Technicians (CAM-T) and the Certified Apartment Managers (CAM) Maintenance for Managers programs. 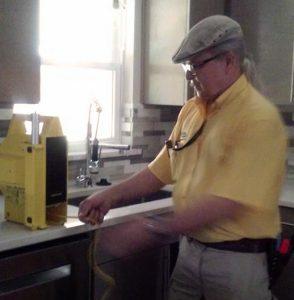 He also has inspected historic houses that were built in the 1800’s, modern or innovative designs such as Berm homes, and Structural insulated Panel (SIP) houses. Being the owner and operator means that it will be Bud whom answers the phone and sets your appointment, Bud will be the one who meets with you to inspect your home or property, and later if questions should arise, it will be Bud whom answers them. His business operation is simple and efficient. He has never canceled an appointment, never moved or “bumped” an appointment to accommodate a more lucrative inspection. He does not pay to be included to any agent’s “list”, however, he is proud of the fact that many agents think enough of their clients to include him to their list of inspectors. He builds his business one handshake at a time. If you’re new to Dallas area, you should want a home inspector with a lifetime of of experience with local building construction. “Bud” Rozell is an ASHI Certified home inspector (ACI). ASHI Certified Inspectors are the only true 3rd party certified Inspectors in the industry that are accredited by the NCCA. Bud is the current Chapter President of Lone Star ASHI, the Texas Chapter of the American Society of Home Inspectors which adds to his unique qualifications making him an exceptional fit in any market. Texas Real Estate Commission 4088 (1996). Texas Structural Pest Control Services 12288 (2000). American Society Of Home Inspectors (ASHI) – Certified ASHI Inspector 244798 (2005). For the winter months of November, December and January, Good Home Inspection has expanded its market service area to include; Addison, Allen, Arlington, Balch Springs, Bedford, Carrollton, Cedar Hill, Cockrell Hill, Colleyville, Coppell, Dallas, DeSoto, Duncanville, Euless, Farmers Branch, Fate, Flower Mound, Forest Hill, Forney, Frisco, Garland, Glenn Heights, Grand Prairie, Grapevine, Hackberry, Haltom City, Heath, Hebron, Hickory Creek, Highland Park, Highland Village, Hurst, Irving, Justin, Kaufman, Keller, Kemp, Lake Dallas, Lancaster, Las Colonias, Lavon, Little Elm, Lucas, Mansfield, McKinney, Midlothian, Murphy, North Richland Hills, Ovilla, Parker, Plano, Princeton, Prosper, Red Oak, Richardson, Richland Hills, Rockwall, Rowlett, Sachse, Seagoville, Southlake, Sunnyvale, The Colony, University Park, Waxah achie, White Settlement, Wilmer, and Wylie. There will be no additional travel fees associated with these areas for a limited time. "Bud" Rozell, ACI TREC PI 4088: ASHI Certified Inspectors are the only true 3rd party certified Inspectors in the industry that are accredited by the NCCA www.credentialingexcellence.org/ncca.